The social network tries—again—to get away from clickbait. 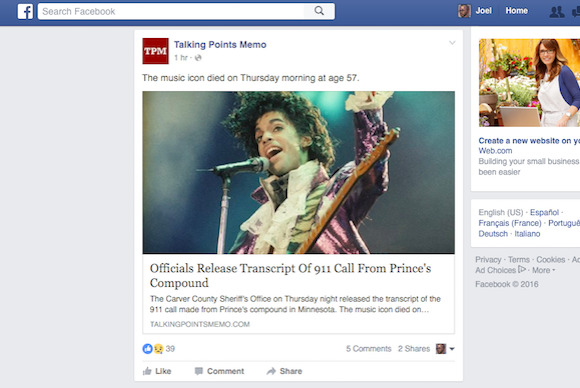 Facebook wants to put a nail in the coffin of clickbait, so it's changing your News Feed. Again. The social network is tweaking its algorithm to show users more stories that they’re likely to spend time reading. “With this change, we can better understand which articles might be interesting to you based on how long you and others read them, so you’ll be more likely to see stories you’re interested in reading," Facebook’s Moshe Blank and Jie Xu wrote Thursday. The update won’t entirely eliminate clicks as a piece of Facebook’s algorithm so much as de-emphasize them a little bit—the social network seems to be aiming for a mix of quantity and quality. “This update to ranking will take into account how likely you are to click on an article and then spend time reading it,” the duo wrote. In other words, those “You’ll never guess what happened NEXT” headlines might still be showing up in your feed. This isn’t the first time that Facebook has promised to emphasize time spent with a story in order to reduce clickbait. In August 2014, the company said it would begin measuring a user’s time away from Facebook after clicking on an article. “If they click through to a link and then come straight back to Facebook, it suggests that they didn’t find something that they wanted,” the company said in a blog post that summer. Since then, Facebook’s model has changed somewhat—it sends less traffic away to outside sites and instead hosts videos and articles directly for a number of publishers, sharing advertising proceeds with them. Why this matters: Every change Facebook makes to its News Feed algorithm matters mightily to publishers: The New York Times reported this week reported that 85 cents of every online advertising dollar goes to Google or Facebook. And publishers have long argued that click-driven ad metrics are often not very useful, with research suggesting that most people usually spend less than 15 seconds on a page they click on social networks. The hope? Emphasizing quality and quantity will give publishers more incentive to create work that keeps the audience truly engaged. If Facebook's efforts succeed, your News Feed will be filled with high-quality stories instead of garbage.